Al-Kotb, Mayar Nawara, Hani Farouk A. Although ancient Egyptians were the first to describe the brain, the services that are provided to patients with disorders of the brain and the number of trained neurologists in Arab and African countries is at best centralized in large cities and at worst nonexistent. The combined Arab and African population is 1.5 billion, around 23 percent of the world population. With current improvements in vaccination programs and water sanitation, the mean age of the population is increasing, and it is estimated that by 2030, the burden of noncommunicable disorders will be higher than communicable disorders in Africa. 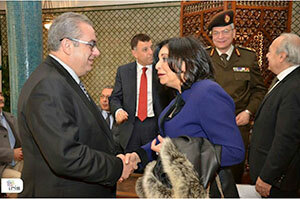 From left to right: Dr. Jean Jabbour, a WHO representative and one of the guests of honor, greets Laila Negm, honorary meeting chairman. Gathered in back, from left to right: Professor Mahmoud Elmetieni, dean of the faculty of medicine, Ain Shams University; Professor Bahaa Zidan, head of Elgalaa Military Medical Compound and a guest of honor; and Professor Magd Zakaria, meeting chairman and head of the neurology department, Ain Shams University. The number of trained neurologists is steadily growing. Specialized neurology services for stroke, epilepsy, headache, neurorehabilitation, and neuromuscular disorders, among others, are starting and successfully growing. These services can be found in Cairo and to a lesser extent in Alexandria and Assiut. Apart from this, the mere presence of a trained neurologist is an exception. It is a common scenario to find a community of 1 million to 3 million inhabitants who are served by one to two neurology consultants, who may be living in another place and shuttling back and forth. The brain drain happens from these areas to Cairo, in addition to other countries. Neurology education in many sub-Saharan African countries is almost nonexistent. Around 90 percent of African universities do not have master degrees or other forms of formal training modules in neurology. Most of the trained neurologists get their training abroad. Many leave their countries because there are no posts for neurologists in the university or the ministry of health. The number of trained neurologists in many countries can be counted on two hands. For instance, only 11 countries in Africa have more than 10 neurologists per country, five countries in Africa have only five to 10 neurologists per country, and 23 countries in Africa have one to four neurologists per country. In countries with good neurology training programs, well-established neurology services can only be found in central cities, and patients have to travel for hundreds of miles to find a good neurology service. For the aforementioned reasons, Ain Shams University has been endorsing an initiative called Treat and Teach, which is designed to develop short- and intermediate-term strategies to reduce the gap in the number of trained neurologists and the deficiency of neurology education programs in Africa. We are trying to complement the current efforts to improve neurology education in Africa with an initiative that has a mix of online education and on-site clinical training, while working on establishing medical services that may include a stroke unit, memory clinic, neurorehabilitation units, or a neurology department. Master degrees will be given from Ain Shams University, Cairo, and work will be done to establish local master degrees in rural centers. This could lead to national neuroscience services run by local providers. To promote this initiative, Ain Shams University organized the First Arab African Teleneurology Conference: A Treat and Teach Initiative. 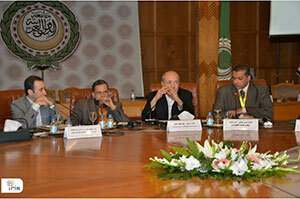 Held in the League of Arab States January 19–20, 2016, the conference was designed for medical and non-medical stakeholders. Representatives of Ain Shams University, the League of Arab States, Egyptian ministries of health, foreign affairs and communications, Egyptian military hospitals, the American Telemedicine Association and WHO joined the discussions, in addition to 247 attendees representing 12 countries and 13 universities. The high prevalence of neurologic disorders, their impact on the community in terms of mortality and morbidity, and the importance of time-to-start management and clinical expertise to manage these sophisticated cases. The clear deficiency in trained neurologists in rural parts of Arab countries and in most African countries. 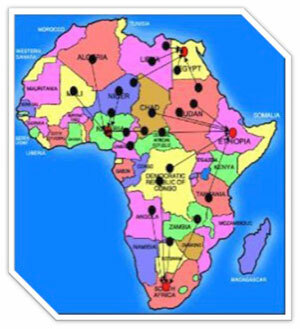 The increasing numbers of trained neurologists and specialized neurology services in large cities, such as Cairo, the challenge to use these experiences in rural areas and avoid the brain drain problem, and the importance of establishing stronger inter-African communications to bridge geographical barriers. Presentations from international experts in the field illustrating experiences from the Mayo Clinic, Harvard, California and the U.K.; experiences from Egypt and Sudan were also presented. The great potential and readiness for change in many sub-Saharan countries. Africa is a young continent, with an average age of 17 to 20 years old. Africa will have the largest workforce in the world in the next 25 years, and seven out of 10 of the fastest growing economies in the world are sub-Saharan African countries. Government spending on health care worldwide is the highest in Africa (18.4 percent). The number of Internet users in Africa multiplied 70 times from 2000 to 2010. As a proof of concept, four speakers invited from the U.S. used telecommunication technologies to give live interactive sessions showing scientific information and giving second opinions about selected cases. Meeting roundtable participants include, from left to right: Tamer Emara, the meeting’s scientific coordinator, associate professor of neurology and the head of the teleneurology unit, Ain Shams University, Cairo; Professor Hani Aref, neurology department, Ain Shams University; Professor Magd Zakaria, meeting chairman and head of the neurology department, Ain Shams University; and Moderator Amr Abd Elmoneim, assistant professor of neurology, Ain Shams University. Ain Shams University has agreed to start the first teleneurology unit in Egypt. Ain Shams has signed several agreements with Egyptian hospitals and African universities to start a proof of concept phase of hospital-to-hospital acute care teleneurology service that would be complemented with bilateral mobility to facilitate service development in remote areas. Similar agreements with international centers of excellence are also underway. 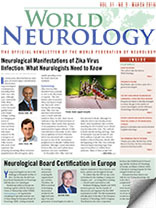 Additionally, Ain Shams University, WHO, Egyptian ministries of health and foreign affairs, military forces, and the Arab League are currently collaborating to establish an Arab African center of excellence for neurology, neurosurgery and teleneurology, which would serve as a regional center of excellence to support best medical practices and education. The management of this center should provide a self-sustained investment model that would facilitate public-private partnerships. Ain Shams University is currently preparing an initial proposal for this project. A copy of this project will be delivered to the Egyptian government and another copy to the meeting of Arab Ministers of Health meeting. It is of utmost importance to nurture local neurology leaders by giving them the right mix of scientific and management skills, in addition to logistically supporting their starting neurology programs. Although we think highly of new telecommunication technologies as a way to bypass geographical barriers, we are aware of its limitations. Neurology, as all other medical specialties, requires direct face-to-face interactions with mentors and patients alike, thus the essential role of bilateral mobility in the Treat and Teach Initiative. Sustainability is always a key issue in developing services. It is estimated that 90 percent of telemedicine projects stop after a few years. The role of education, in addition to telemedicine practice, is essential to ensure the sustainability of this project. Thinking of the spoke as a “hub in evolution” is mandatory in our view to promote the growth and progress of the best medical care to this large population of the world. The other important guarantee for sustainability is the integration of telemedicine practice in everyday work. Work should be done to establish centers of excellence that are strategically located and connected to peripheral hubs in a model that allows growth, dissemination of knowledge and sustainability. This lies within a health care system that offers support to everyone in the community. The self-sustained investment model and the idea of promoting local neurology champs would ideally offer physicians working in remote areas more self-actualization values, in addition to a decent financial revenue that can help reverse the brain leak of trained clinicians. The research programs of these centers should be targeted toward the actual needs of this part of the world, developing the concepts and finding new solutions for better health care delivery. The real change would be to gain the ability to produce knowledge. World federation of neurology council of delegates meeting, at Sydney, Australia. World. Neurology 2005; V20 N4. Tamer Emara is an associate professor of neurology and head of the teleneurology unit, Ain Shams University, Cairo. Mohamed Sherif Al-Kotb is an associate professor of materials science and head of the projects and development unit, Ain Shams University. Mayar Nawara is a resident of neurology and psychiatry and coordinator of the teleneurology unit, Ain Shams University. Hani Farouk A. Mohamed is the EHealth regional focal point for the World Health Organization – Eastern Mediterranean Regional Office (WHO/EMRO). Ahmed Elbokl is a lecturer of neurology and coordinator of the teleneurology unit, Ain Shams University.